Mama and I have been trying to eat better and move more. Visit the FitBit website to see which device would best fit into YOUR lifestyle. 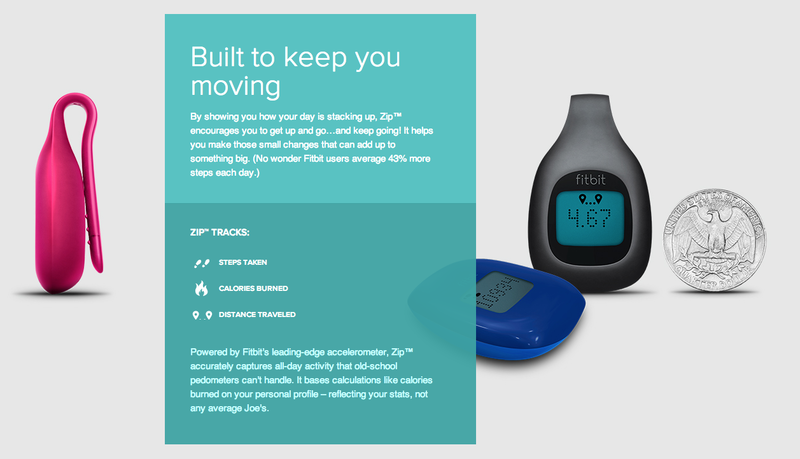 I purchased the fabulous FitBit Zip and I L-O-V-E it! FitBit is an accelerometer. It catches your every step, every move. Up, down, forward, backward, and side to side. FitBit has you set daily goals for steps, calories burned, and calories eaten. It's SO helpful to see it on the device and on the App. You can add friends who also have a FitBit and "cheer" each other on. It is so motivating!! I move wayyy more during the day, it's neat to watch how many steps you have taken and how many calories you have burned. FitBit works with a myriad of different apps --- I use the LoseIt app to track my food intake, which syncs with the calorie count on the FitBit app. In the first week I owned this little jewel, I lost 2.5 pounds! I have a goal in mind of when I can purchase their scale that syncs with the FitBit. I know, that is a fortune to pay for a scale. However, I am literally pacing my house at 10 o'clock at night, making sure I get my 10,000 steps. This week that hasn't happened... I have been rather sick, but hopefully some new meds will help get be back to 100% soon! It's Saturday afternoon. I feel like #*%! and what do I do?? 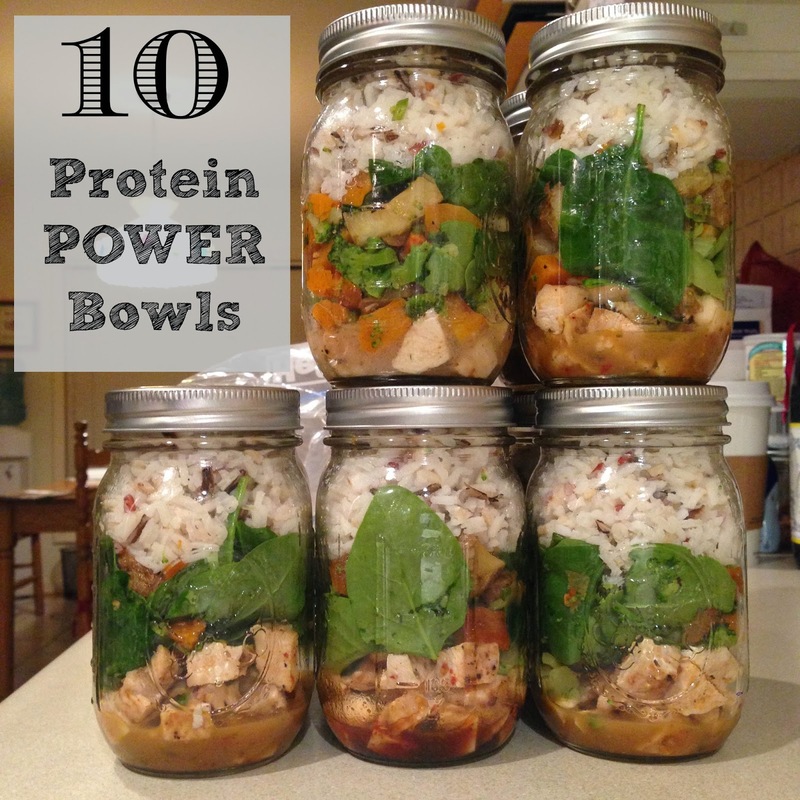 I make ten protein power bowls for Mom and my lunch next week! I packed these little filling lunches in mason jars, everything is cuter & better in a mason jar. And... The best part! I made them from things I already had. I didn't go to the store --- just used what I had in the fridge and pantry. Begin by measuring your rice. *Rice is super easy. 2 to 1 ratio. 2 waters to 1 rice. So, for 2.5 cups of rice, I used 4.5 cups of water. * Boil your water before adding the rice. Once the water is boiling, add the rice slowly, stirring while pouring in the rice. Bring the whole shebang back to a boil and reduce the heat to simmer. Put a lid on the pot, and do not peek for 15 minutes. Around 15 minutes, lift the lid, stir around and place back on. Turn heat off. Let sit covered for about 10 minutes. My new fave seasonings. I put them on everything! Place your butterflied chicken on a sheet pan, drizzling a bit of Olive Oil over the top, on each side. Followed by a sprinkle of either Montreal Steak Seasoning or Smokehouse Maple. Roast in oven on 350˚ for about 15 minutes. **My secret, I don't preheat my oven! I put the chicken breasts in a cold oven, then turn on. Usually once it preheats the chicken is done. 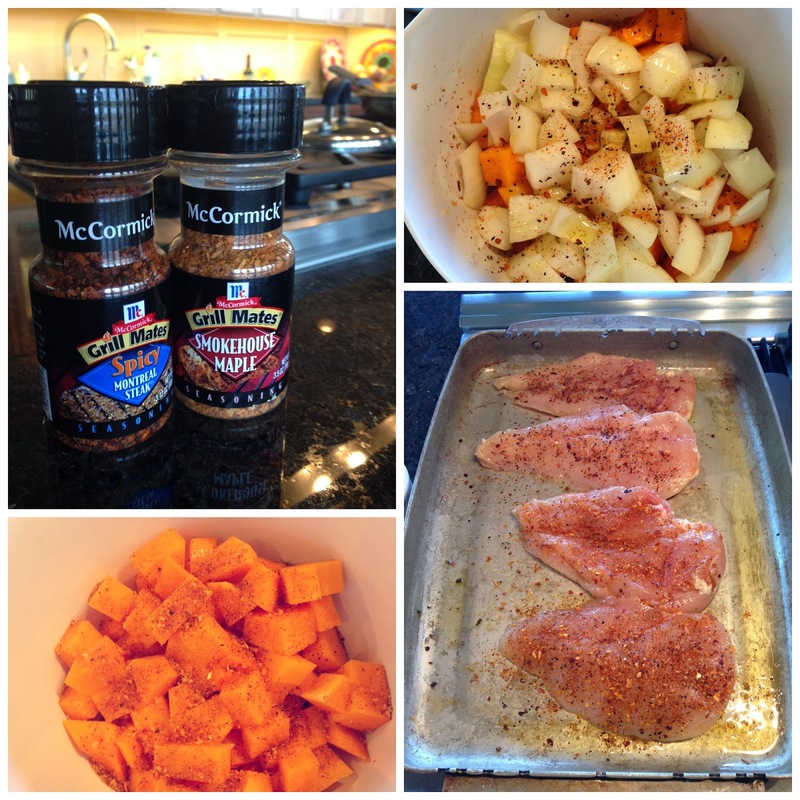 ** Remove from pan and place on plate, covering tightly with foil. Dice your veggies while the chicken bakes. Put in bowl, drizzled with olive oil and both seasonings. Add your chopped veggies to the pan the chicken came off of. Place back in your hot 350˚ oven and roast for 20 minutes. Or, until the veggies are browned and crispy on the edges of the onions. If you are microwaving your frozen broccoli, do it now. If you have fresh broccoli, cut the florets off, and roast with the squash, onions, and potatoes. The spinach. Put in a large bowl. The hot vegetables will go on top and steam it. Take your veggies out of the oven, and pour over the fresh spinach. I had some wilting green onions, that I sliced on a diagonal and sprinkled on top. 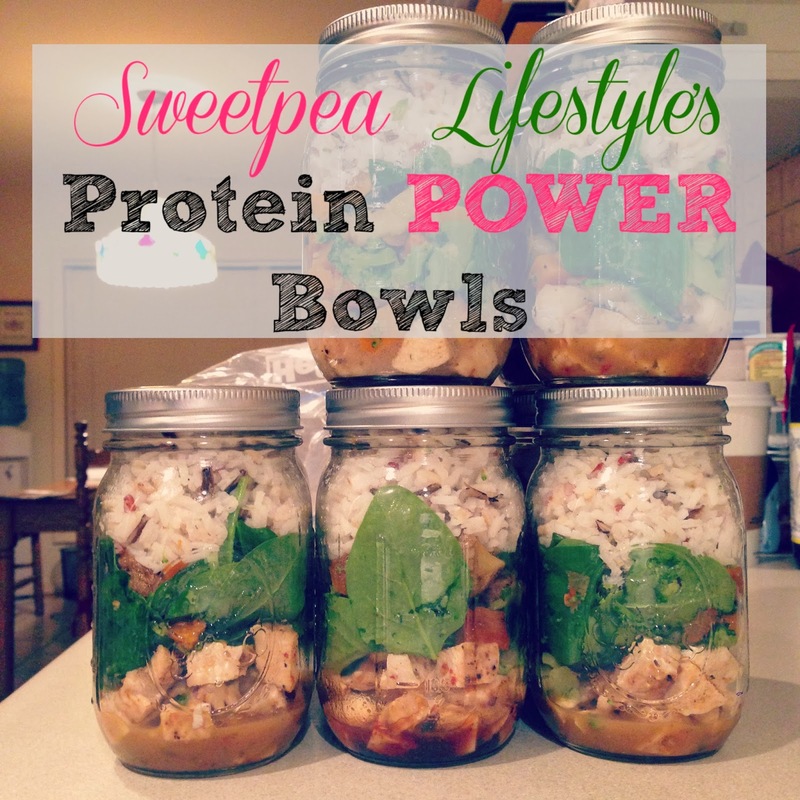 Wait till everything is completely cooled before measuring into mason jars, or other types of food storage vessels. Now, we can measure everything into the jars. 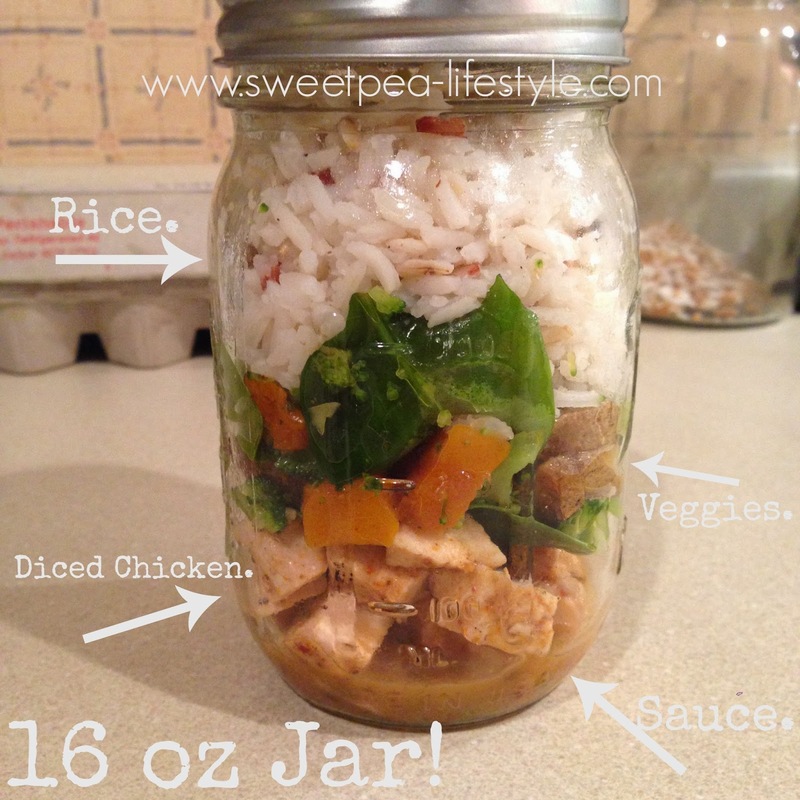 I put 2/3 cup rice, 1/2 cup of chicken (about 2.5 ounces), and a cup of vegetables in the jar. When ready to eat, dump onto a plate or bowl, and heat in the mircowave for a couple minutes. You can use any type of sauces on these bowls! Trader Joe's makes some great Teriyaki, Stir Fry, Curry, and other sauces. For these, I put different salad dressings in the bottom. A tablespoon of each: Greek Dressing, Asian Peanut Dressing, and Island Soyaki Dressing. Each bowl is only 4 WW Points+. If you add a tablespoon of sauce, add another point! That is a great lunch that will keep us and YOU full and fueled for the afternoon! Does the 4 points include the 3 tablespoons of dressing? No, it is not. I used a oil and vinegar mix, and only one tablespoon. Making the total bowl 5 points! I have found I can use less dressing with so much "stuff" going in! 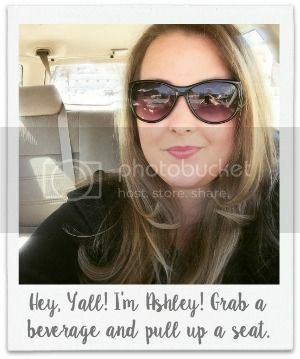 I searched for something besides salads in a jar and found your recipe. I can hardly wait to try it. I'll want to make some for me and some for my daughter. Thank you so much.